Welcome to the darkside!! ..lol… Couldn’t even finish typing that with a straight face..hehe. Yeah I am not the dark type but I have to say I have always been fascinated with skulls. I have had skull things in my closet for many many years and I just don’t get the fascination. But I guess I don’t have to psycho analyze everything in life right? So am just letting it be. But how can you not like this beautiful freaking neckpiece. It totally reminds me of Guns and Roses except this is “Skulls and Roses”. It’s just a freaking coincidence that for this shoot we were walking to a location I had picked but stumbled upon this beautiful tiny garden along the way. It fit the dark theme perfectly with the grey wall and the happy and sad face [reminding me of Hamlet] and the dead roses. Ok so maybe I do have a tiny bit of a dark side, but there is some beauty in morbid stuff too I feel. Very funny post Prutha, you crack me up. 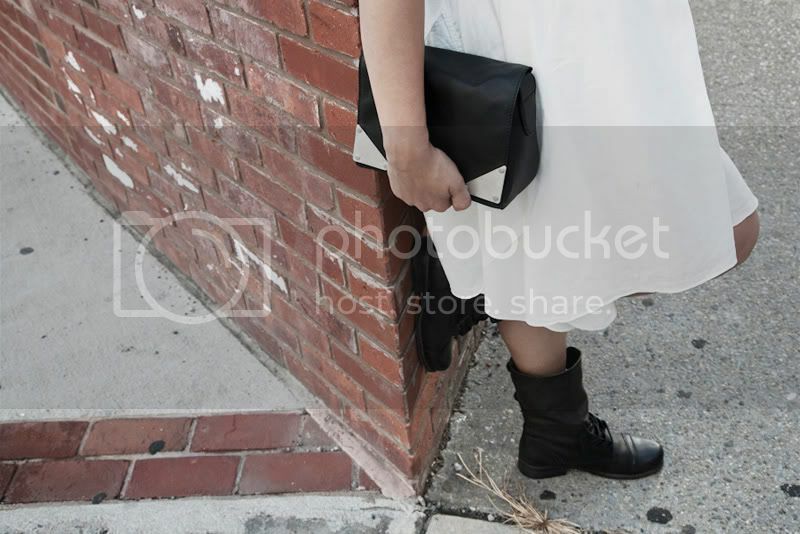 LOVE the black/white and your boots! sigh. And those rings are fantastic. In design school, I used to doodle skulls for fun, as kindof a base of practice for life-drawing, proportions. I know, the irony is too much. Anyhow, that was 17 years ago. I don't get why they are so trendy now either. Skulls and mortality have been design elements in art for several hundred years...paintings, woodcuts, architecture, and you mentioned Hamlet! each post here is always a visual treat! 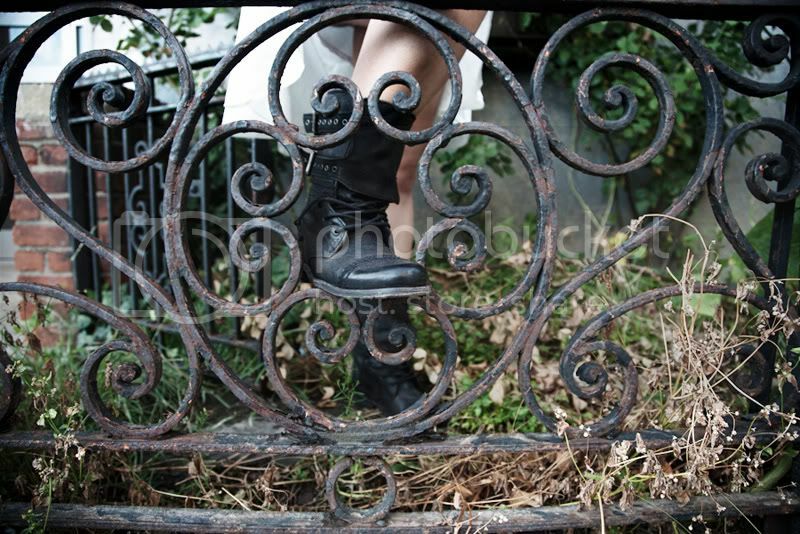 And I love this dead garden too, skulls et al..
You have one kewl collection of accessories there babe! You look amazing!! And you jewellery is stunning!! I like it! And your blog is very nice. I'll follow you from now on. Hope you'll follow me too. 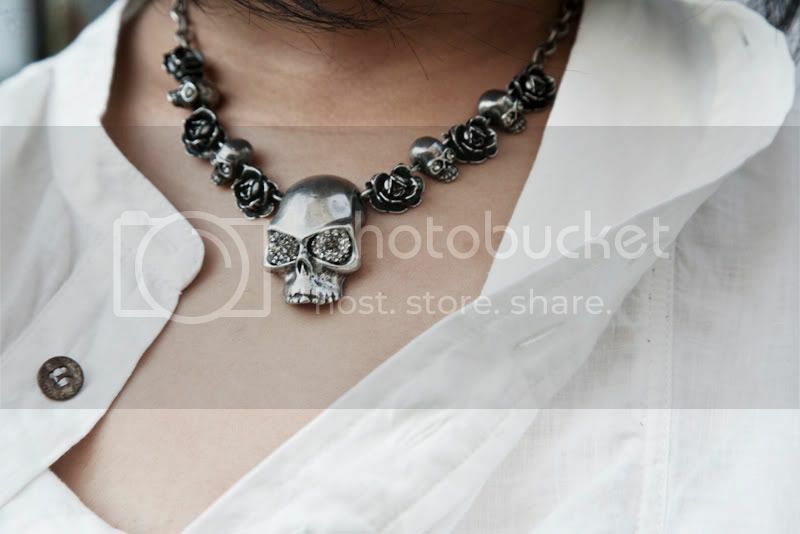 I love that skull necklace!!! What a great piece! Love the window and grey wall in first pic.. All Saints is amazing..
Love the skull neck piece. Your mum is going to freak out...haha. Wow - that location is so beautiful! love your boots, too! Wow, those boots are rockin'!!!!! Cherie your pick of clothes are so radical! lovelovelove your necklace! i need one just like it! loving the skull necklace....and the dress!!.. Love how the dying rose ironically adds so much life and color to the second shot! Or maybe you're a pirate. Ahoy me hearty!